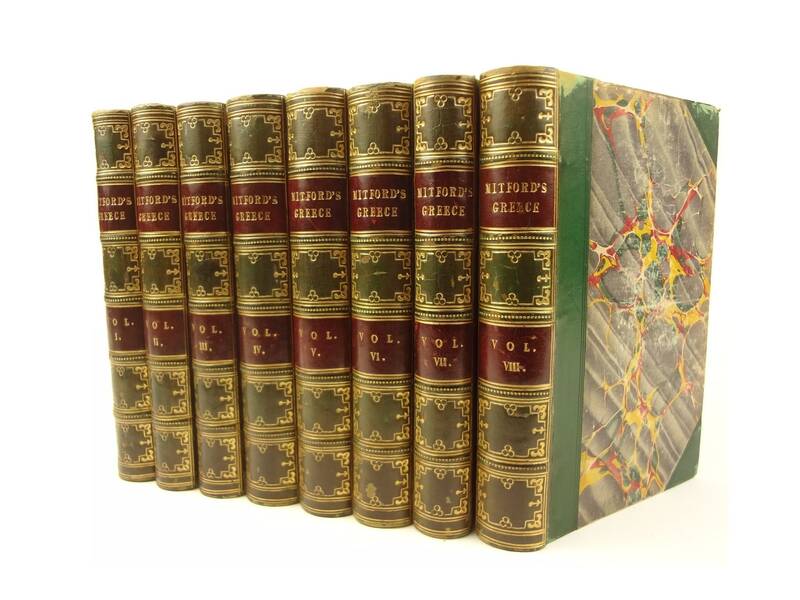 William Mitford's The History of Greece, complete in eight handsomely bound volumes. 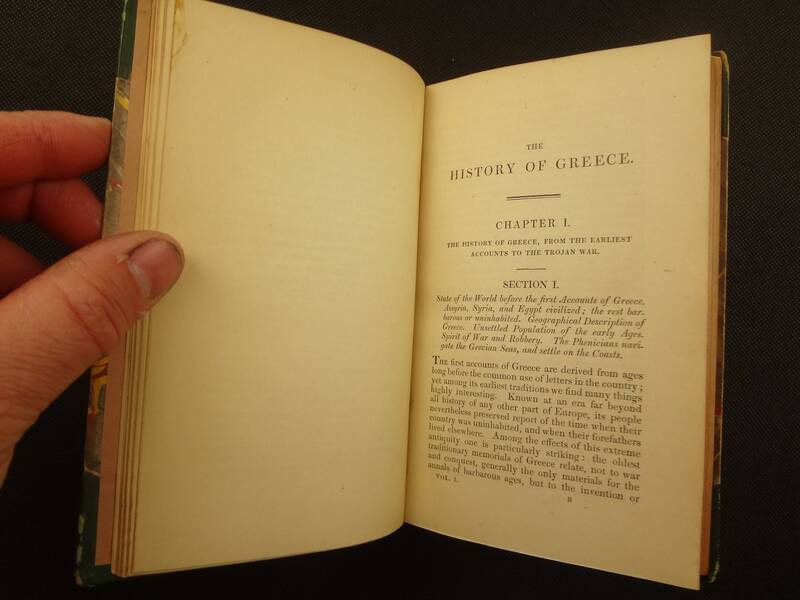 Each volume with an engraving on the title page. 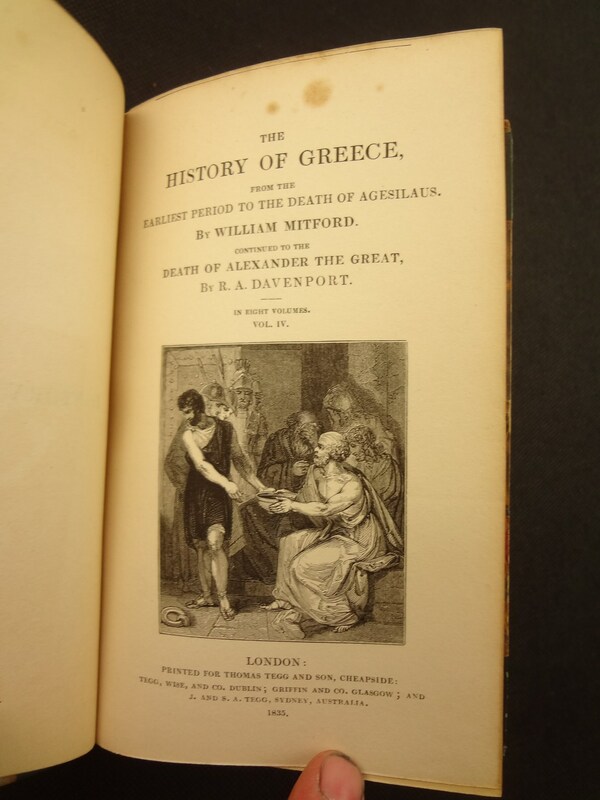 "From the Earliest Perod to the Death of Agesilaus" by William Mitford, "Continued to the Death of Alexander the Great" by R.A. Davenport. 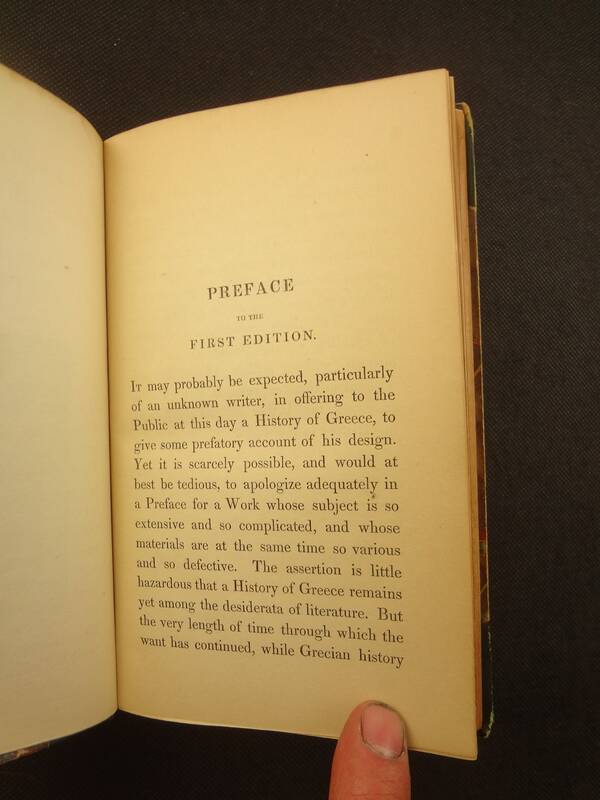 Printed in 1835 by Tegg and Son, but the page facing the title page of volume one says that it was printed at the venerable Chiswick Press, by C. Whittingham. 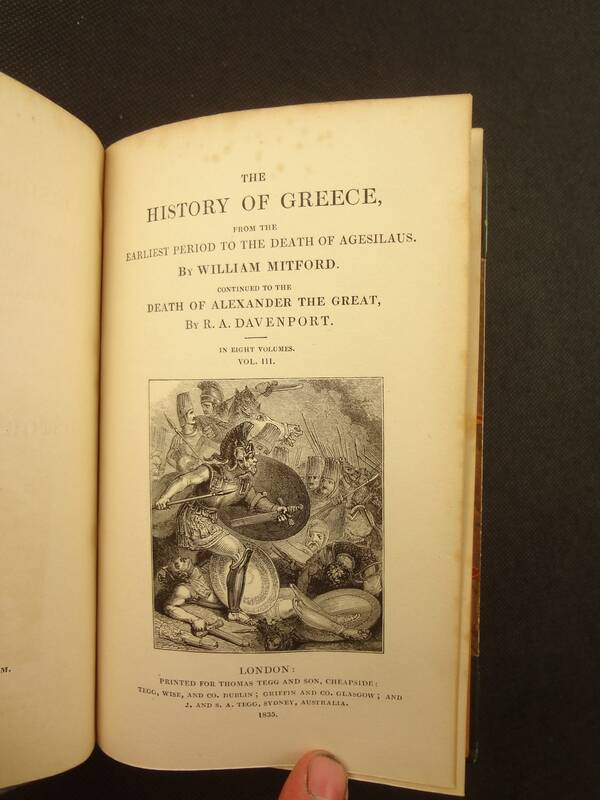 William Mitford (1744 –1827) was an English Member of Parliament and historian, best known for his The History of Greece. Mitford married Miss Fanny Molloy in 1766. 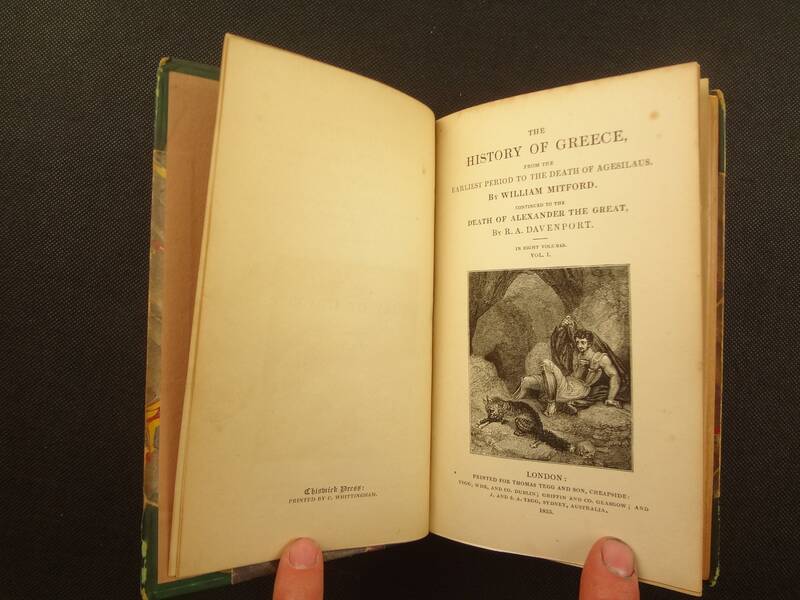 He retired to Exbury for the rest of his life, and made the study of the Greek language his hobby and occupation. After 10 years his wife died, and in October 1776 Mitford went abroad. 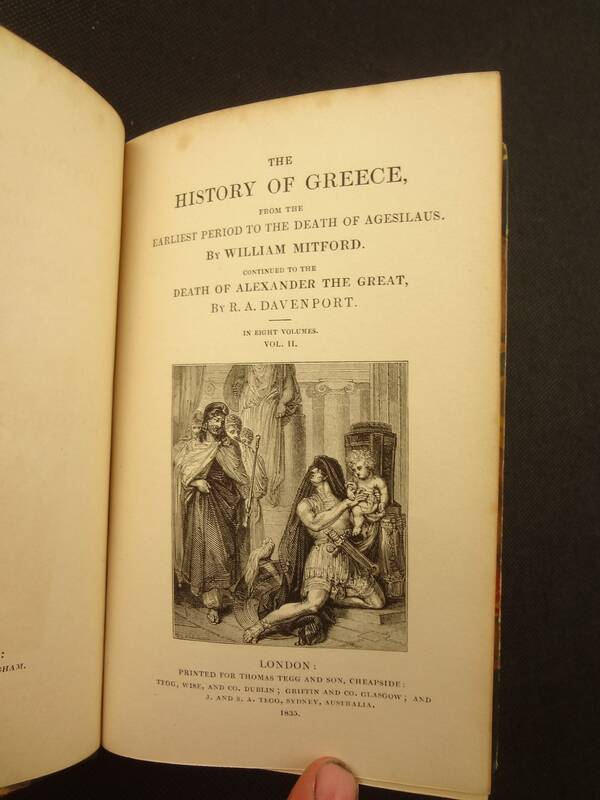 He was encouraged by French scholars whom he met in Paris, Avignon and Nice to give himself systematically to the study of Greek history. But it was Edward Gibbon, with whom he was closely associated when they both were officers in the South Hampshire Militia, who suggested to Mitford the form which his work should take. 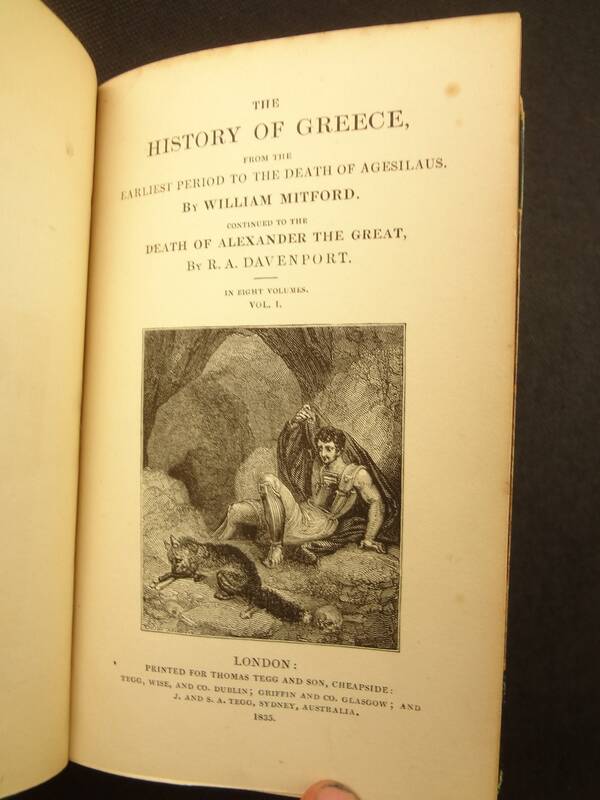 In 1784 the first of the volumes of his History of Greece appeared, and the fifth and last of these quartos was published in 1810, after which the state of Mitford's eyesight and other physical infirmities, including a loss of memory, forbade his continuation of the enterprise, although he painfully revised successive new editions. Each vol. measures approx. 16.5 x 10.5 x 2 cm. 1/4 leather with leather corners and marbled boards. Spines have five raised cords, with gilt decoration in four compartments, and the author, title and volume in gilt on red Morrocan in two compartments. Top edge gilt. 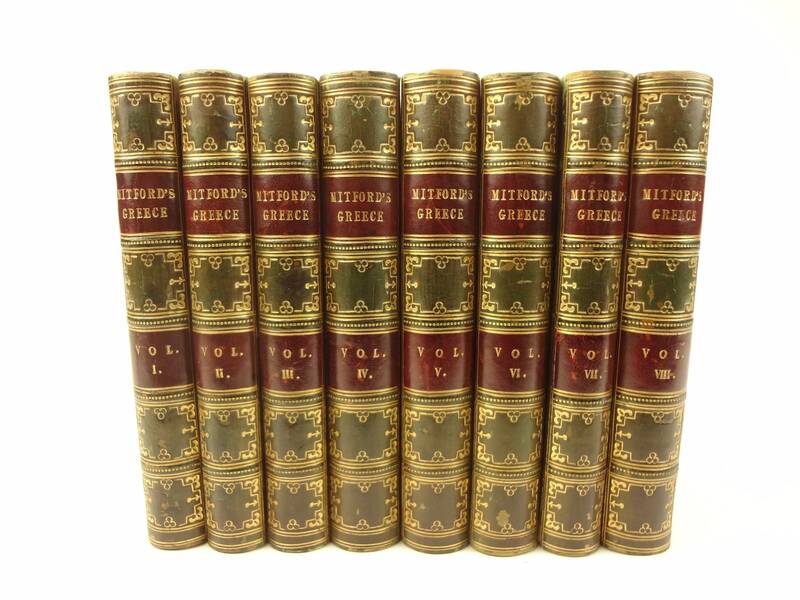 Complete in eight volumes. Each volume has an illustrated title page. See pictures. Shelf wear with some rubbing, corner and edge wear, etc. Leather still feels good (not dried out). Slight sunning to spines. Vol. 1 has pencil price at top of blank front endpaper. Occasional foxing spots, mostly towards front, not excessive (in all volumes). Vol. 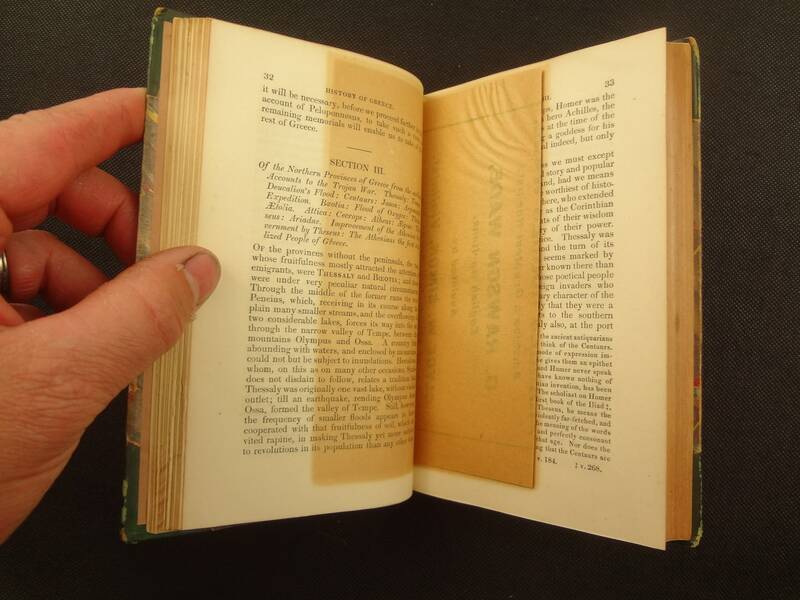 1, page 32/33 has a 19th century theatre advertisement loose, which has yellowed the facing pages. Vol. 1 rear blank flyleaf has single 1 cm edge tear. No other writing in any of the volumes, that I find. Very occasional dog-eared page. A nice set, attractive, and entirely readable.